World renowned sailor, Dee Caffari MBE has been announced as an Ambassador to Youth Charity UKSA. Dee became the first woman to sail solo around the world the wrong way, non-stop in 2006. Following her circumnavigation in 2006, her sixth place finish in the Vendée Globe in 2009 made her the first woman to sail solo and non-stop in both directions around the Globe. As a member of Team SCA in the Volvo Ocean Race in 2014/15, Dee completed her 5th trip around the world last year with the all-female crew, an inspiration to all women around the world. 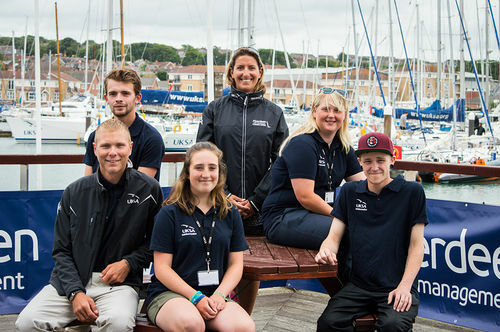 Dee, a former P.E teacher, started her training at UKSA’s centre in Cowes with a Watersports Instructor Training (WIT) course which led onto the Pro Crew & Skipper Training (PCST) course which is now equivalent to the Professional Yachtmaster qualification. As a graduate of UKSA (one of the world’s leading training centres) Dee is perfectly place to understand and promote UKSA as an organisation that breaks down barriers and gives young people the hard and soft skills not just for the maritime industry but for wider employment. Dee will use her elite sporting background and interests in youth sailing to work across all of the areas of UKSA’s work that she so passionately believes in.